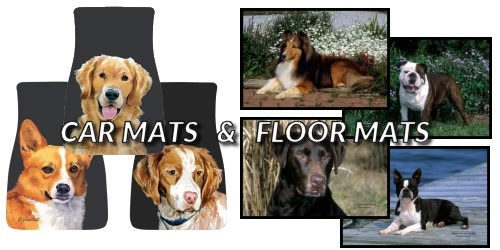 Dog Breed Car Mats set feature dog breed artwork and are non-skid rubber backed – a lovely addition to your car. Dog Door or Floor Mats measure 18 x 27 inches with black finished edges and are latex backed for indoor or outdoor use. Perfect at doorways.